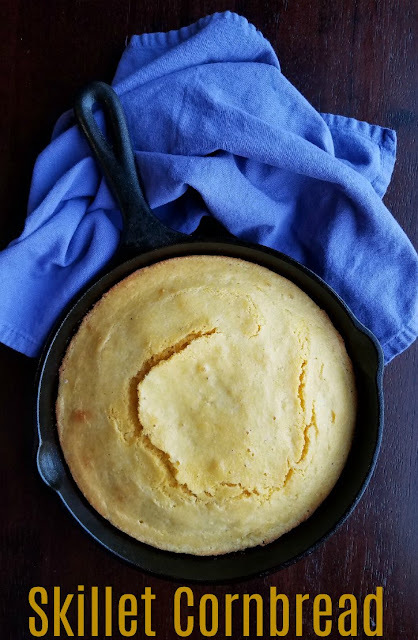 There is nothing like a cast iron skillet full of fresh cornbread from the oven. 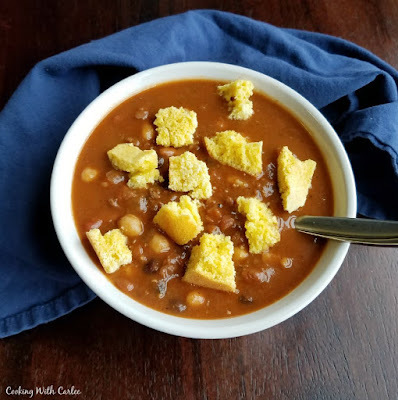 It is perfect with soup, stew or chili. It is also amazing with some butter and a drizzle of honey! 'Tis the season of soups, stews and chili. There is just something comforting about knowing there is a pot perking on the stove or something simmering in the slow cooker. Just the thought of it warms me up a bit which is perfect on these colder days. 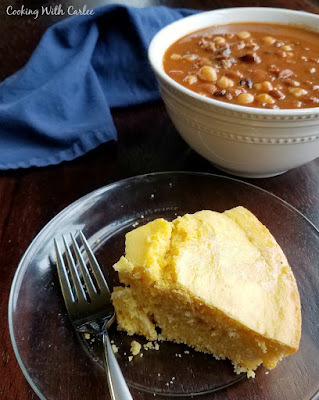 A slice of cornbread is the perfect thing to make that bowl of goodness a hearty meal. Do you know what makes it even more cozy? Making that cornbread in a skillet! Of course the skillet isn't 100% necessary to make this recipe. You could use a 9 inch cake pan or even a square baking dish. But the skillet makes it a little more perfect. I don't know why, it's just a fact! This cornbread is a nice middle ground kind of cornbread. It has a course crumb without being too crumbly. It is a bit sweet, but not too sweet. It is great served as a slice with butter and maybe some honey but is also yummy crumbled over chili. The best part is the batter comes together in a jif. It takes very little effort and it comes out of the oven all warm and toasty. Just seeing it lets you know good things are ahead! My husband refuses to believe a bowl of soup on its own counts as dinner. So we always have to have something on the side. He would almost always choose chili if forced to pick a soup for dinner. I also enjoy a slice of cornbread with ham and beans. What do you serve with your soup? Stir together buttermilk, butter, and eggs until combined. Stir in cornmeal, sugar, baking powder and salt until uniform. Pour batter into skillet and bake for 22-28 minutes. You want it to be cooked through and very lightly browned. Yep, you went straight to Mr. Nines heart for sure!!!! This alone could be his Christmas gift, lol!! 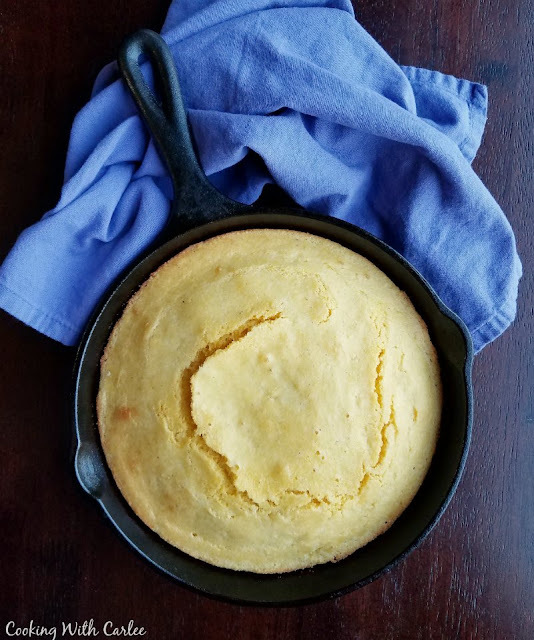 He loves his cornbread and I love cast iron cookin'! Wishing you and your beautiful family a very Merry Christmas sweet friend! Thank you, Andrea, and Merry Christmas to you all! I have been looking for a new cornbread recipe to grab my attention, and yours sounds exactly like what I am looking for. I will try it this week when I get those beans 'n ham going!